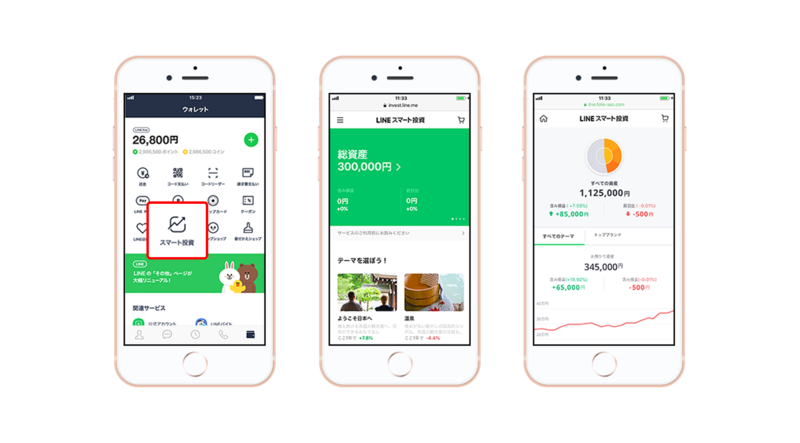 TOKYO – October 18, 2018 – "LINE Smart Invest," a new service jointly operated by LINE Financial Corporation ("LINE Financial") and FOLIO Co., Ltd. ("FOLIO") that welcomes first-time and novice investors to build wealth by investing in familiar themes through the LINE app, begins operation today *1. *1: The service will be released in phases starting from 11:00 am (GMT+9), and is expected to be fully released by 2:00 pm (GMT+9) on Oct 18. LINE Smart Invest is a new mobile-based investment service designed to make investing fun and easy for inexperienced users. To build their wealth, users can access the service from the LINE app and start investing in a variety of themes (currently around 70), such as drones, young women's trends, VR, and cosplay, based on their personal preference. By offering theme-based investment products at an average minimum investment of JPY 100,000, and adopting portfolio diversification that mitigates stock price volatility risks, this next-gen service provides asset-building opportunities to a wider range of users. LINE Smart Invest is based on FOLIO, the next-generation investment service that went into full-scale operation on August 8. FOLIO is operated by the eponymous online securities company that offered theme-based investment products in Japan for the first time. Many people in Japan are concerned about the assurance and stability of their post-retirement years. With the falling birth rate putting a strain on the country's pension system, changing working conditions chiseling retirement bonuses, and ultra-low interest rates, building wealth through investments is no longer without implications for many. At the same time, the untapped market population of potential investors who "want to invest but don't know where to start" is said to be around 20 million *2 in Japan. Despite their interest in asset-building, the majority renounce due to their "lack of knowledge," "fear of losing money," and assumption that "investing is complicated and overly sophisticated" *3. Furthermore, the mandatory registration process makes it challenging for many businesses to enter the financial market, not to mention the overwhelming system development cost, forcing many businesses to limit themselves to making minimal updates to their financial services just to accommodate a mobile platform. As a result, users are left with inconvenient services. To change this situation and accelerate the paradigm shift from saving to asset-building that had been previously progressing at a lumbering pace in Japan, the operators of LINE and FOLIO decided to join hands and enter into a capital alliance in January 2018. The latest service combines the LINE messaging app, boasting 76 million MAU *4, and FOLIO, offering investment products on day-to-day themes. Below are the four main features of LINE Smart Invest, designed to help first-time and novice investors start building wealth. LINE Smart Invest is accessible from the LINE Wallet tab in the LINE app, along with the LINE Pay mobile remittance and payment service, and LINE Insurance. "Investing in something I'm interested in helps me to become an expert on the topic, and better forecast my investments' growth potentials," and "I could use this service because it doesn't require specialized knowledge," are some of the ways in which FOLIO users describe theme-based investment products. FOLIO offers investment products on approximately 70 different themes – VR, e-sports, cosplay, drones, and more – spanning 11 categories including "Cutting-edge technologies that will change the world," and "Invest in your passions." The UI is designed to be clear and intuitively operable to reduce investment barriers and make asset-building fun for first-time and novice investors. Whereas reference pages on investments tend to be cluttered with information, LINE Smart Invest's design is mobile-first, focusing on orderliness by displaying accurate information cohesively, and making sure that the design does not cause anxiety or confusion among users. To make the service accessible to a wider range of users, LINE Smart Invest offers an ultra-affordable stock trading fee of only 0.5% of the trading value (JPY 50 minimum; excluding tax) per stock—one of the lowest rates in its market today *5. In Japan, trading units are standardized, which means investors must purchase a minimum of 100 shares per stock. Because this not only requires a significant amount of money but also inhibits diversification of risks, the trading unit system is one of many reasons that make entering the stock market difficult for amateurs. Conversely, LINE Smart Invest allows for fractional stock trading, meaning investors can purchase from as little as one share. With LINE Smart Invest, users can invest small amounts of money in a theme-based portfolio composed of 10 companies. *5: When the consideration is JPY 10,000 or more per stock, compared with four major online securities companies offering fractional stock trading. * To add funds, users must open an invest account and link their LINE account. With the goal to facilitate asset-building for first-time and novice investors, LINE Financial and FOLIO will leverage their technologies, and add new features such as the "Recommended portfolio," allowing for optimized, low-cost wealth management with a simple questionnaire, enable fund settlements through LINE Pay, and more to enhance the user experience over time. The companies will also consider user feedback as well as the service's usage data in future service improvements. Although money is an important daily necessity, the general feeling among many Japanese people towards modern financial services seems to be that they are “complicated and intimidating." In response to this, LINE Corporation announced its plans in January 2018 to reinforce its financial business sector, and established LINE Financial Corporation as a one-stop shop that offers a variety of financial services on the LINE messaging app, including investments, loans, and insurances. LINE Smart Invest is an innovative service with potential to jump-start first-time and novice investors into investing, thanks to its great accessibility and design quality. While FOLIO is a comprehensive asset-building platform, the LINE messaging app has a massive user base. By combining the two, the companies hope to enable anyone to easily start building wealth, and have fun at the same time. Japan is lagging considerably behind other industrialized countries when it comes to integrating asset-building in everyday life. To break the status quo, we must consider the barrier currently separating the economic and social spheres. Conventional financial services still heavily resort to technical terms, numbers, and graphs for explanations, which may be familiar to those in the economic sphere, but largely impenetrable to those in the social sphere. At FOLIO, we have been devoting ourselves to building a financial service that can be embedded in everyday life. With the launch of LINE Smart Invest that combines LINE and FOLIO, we are certain that our service will become more accessible to those in the social sphere. As the heisei era comes to an end, and the paradigm shift from saving to investing accelerates after decades of stagnation, I hope LINE Smart Invest will become a catalyst that revolutionizes the financial world and help make people's lives more enriching and productive. LINE Financial Corporation is a financial instruments intermediary service provider commissioned by its financial instruments service provider to engage in the brokerage of financial products. It does not have the authority to represent the financial instruments service provider. LINE Financial never, under any pretext, receives deposits of money or securities from customers as part of its financial instruments intermediary service. Please see the pre-contract document or other materials for trade details. All information is correct at the time of publication. Diagrams and data are only samples and do not suggest or guarantee future returns or other investment performances. Trades are subject to losses due to price volatility and other factors.